The Swedish Royal Palace invaded by hackers?! That is what happened on 11 June, when the Swedish Royal Armoury was opened up to 30 passionate programmers and developers with one common goal in mind: to hack the european cultural heritage. The mission: create new prototypes and workable apps and mashups for easy and innovative search and display of the Europeana Foundation's 15 million+ resources. And all within 24 hours. One of Sweden's most influential social media activists, Joakim Jardenberg (www.jardenberg.se), considered the event to be maybe the coolest hacker event of the year. He had been invited, together with other web experts, to a parallell seminar session to share views and visions about challenges, possibilities and outcomes related to the digitisation, retrieval and accessibility of the vast collections of 'the memory institutions'. However, making European cultural heritage accessible digitally is an issue that involves everyone. It's not a question of if, but how this material should be released and made open and accessible for all citizens. The main obstacle, says Jardenberg, is when copyright isn't dealt with the way it was originally intended. A big challenge lies in reconciling the European countries' own legislations with the ways in which copyright material is used, and even abused, by the market. What was the outcome of hack4europe Stockholm? The best thing with a hack is that you can expect results. Practical workable solutions. Hack4Europe Sweden was definitely no exception. After a 24 hour race of intensive hacking the participants, grouped in teams, pitched their ideas, concepts and solutions. Among them four winning apps were chosen by the jury. 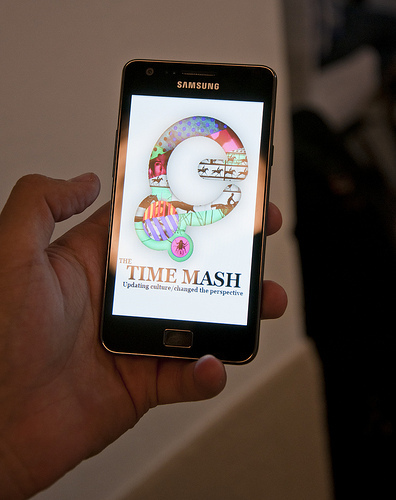 Time Mash by Team Duvebol. Prize for "Most innovative"
Time Mash is a fully working mobile search engine, built as an app for Android, a backend solution and a website. You can search for objects within a map screen, filter data, zoom in, center on your own position etc. The main and most interesting part of the app is that you can capture an image from the collections and combine it with your own picture in order to showcase what the spot you're located at looks like right now compared to what it used to look like. The app will soon be able for download at the Android Market. Museumville by Team Bogus Journey. Prize for "Biggest social impact/inclusion" and "Developers prize"
Museumville is a game based on the digital resources of Europe's museums, libraries and archives. The user is invited to take the role as a museum curator, collect Europeana artifacts (Items) and create exhibitions with them. You can build your own museum, hunt for treasures, show others and keep your exhibitions in order. Fancy Search by Team Pictura. Prize for "Most commercial potential"
Fancy Search is a Europeana search API component for Joomla 1.6. Pictures from the National Heritage Board's archives often lack metadata that can tell the real story about them. This app aims to solve this by crowdsourcing the history behind the photos. It lets anyone browse the collection and submit their own stories in a user friendly way. At the backend one can add metadata depending on the submitted story.